Fair warning- This is a longish post. I waited much too long to write this stuff up, so there is a lot of material to cover! As always, to start at the beginning, click HERE. 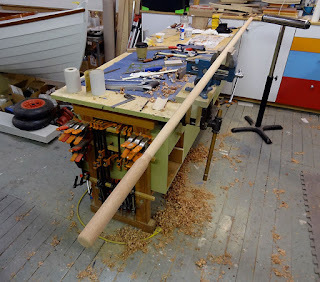 My latest chores on this boat project have been to complete the rudder assembly, including tiller, tiller extension, and rudder blade, plus the daggerboard which I glued up and shaped as well. 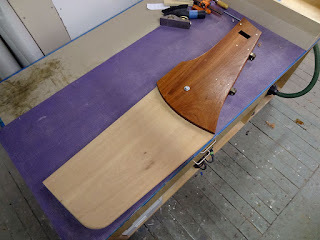 Way back in Part 13, I detailed the rudder layout, making patterns and mock-ups of the parts, then fabricating the core pieces and assembling all the gudgeons and control line sheaves and what-not. 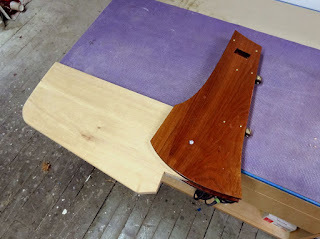 Kick-up rudders are not hard to make, but they must be laid out carefully, and checked for proper operation, at least with paper or mylar patterns. 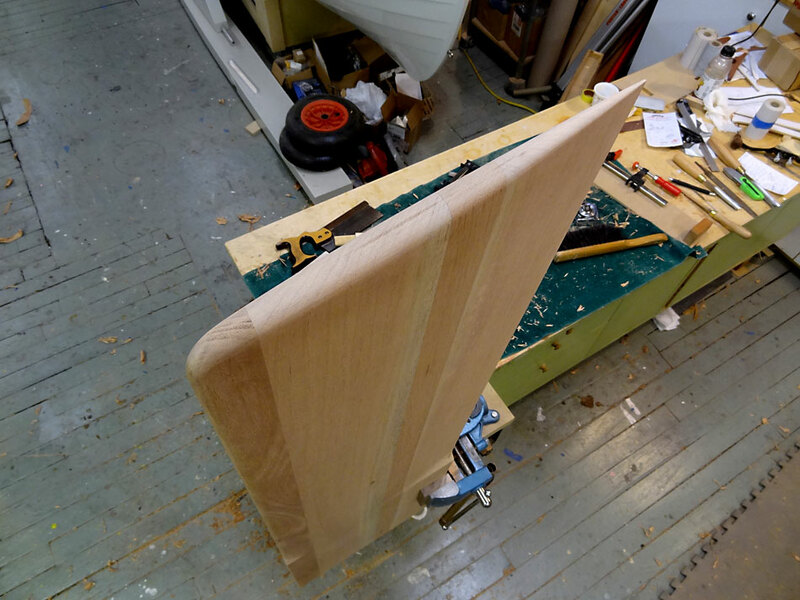 They do have many parts, compared to fixed rudders, but the boat can be beached without removing the rudder, or sailed (at least downwind) in shallow water. 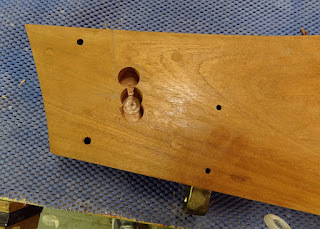 The first thing I had to do on picking the rudder back up, was to cut out the tiller and mortise it through the rudder head. If you remember, this boat has a Norwegian style "push-pull" tiller, to get around the mizzen mast which would otherwise be in the way of a conventional tiller. 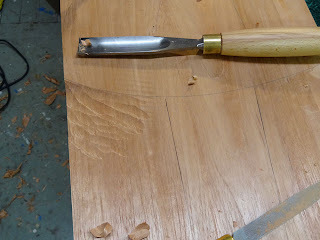 I found a nice piece of ash for the tiller, made a pattern, then traced it and cut it out. 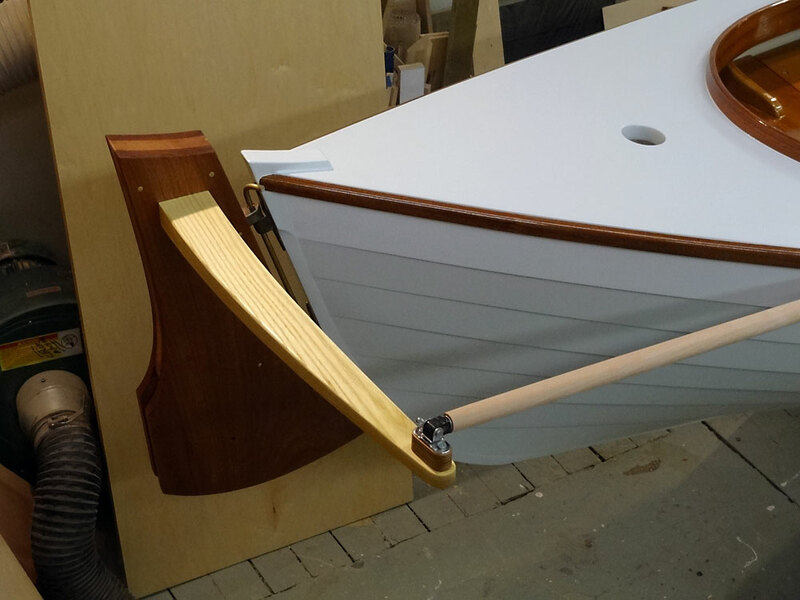 The tiller itself is mortised through the sides of the rudder. I laid out the mortise, then drilled out most of the waste with a forstner bit. I made a router template and cut the mortise with a top bearing bit from both sides, then trued up the hole with a chisel, being careful to square it up in the process. The waste is drilled out with a forstner bit from both sides. 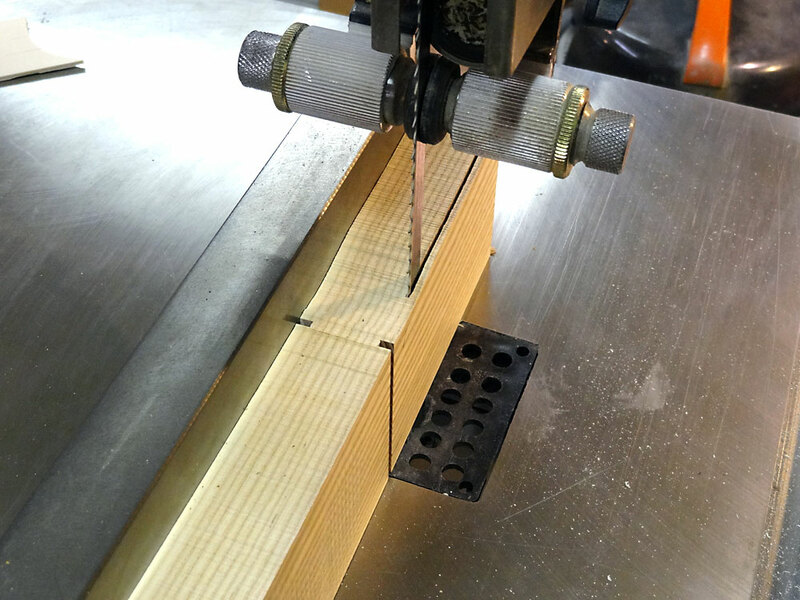 The mortise is chiseled square and true. I like to cut the mortise first, then work the tenon on the tiller. Its much easier to fit the tenon to the mortise than the other way around. 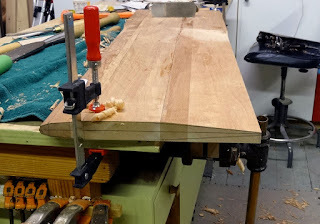 I actually cut the tenon shoulders with the table saw on the rectangular ash blank before sawing the tiller's curved shape, to make it easy to get square shoulder cuts. Then I sawed the tiller out, and finished up the tenon on the bandsaw and tuned it with a rabbet plane. 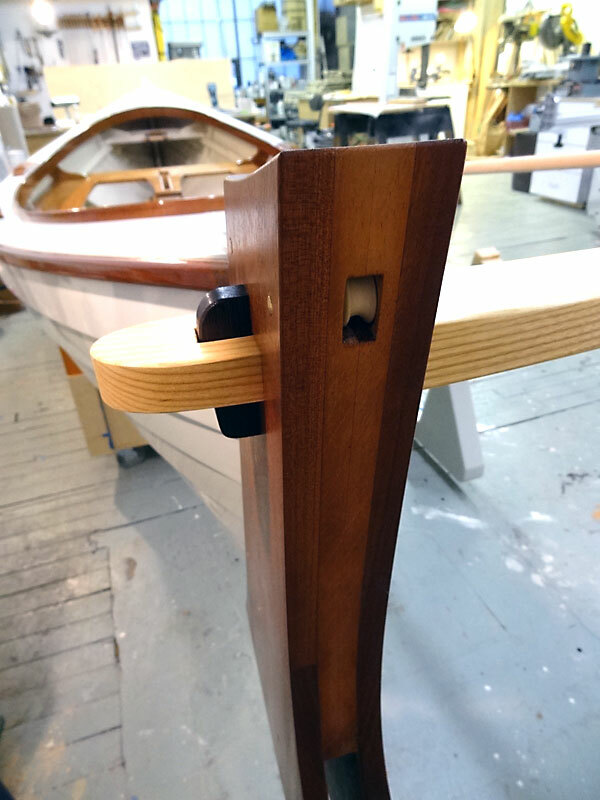 The tiller is held tight to the rudder with a wedge through the tenon (this is sometimes called a tusk tenon). 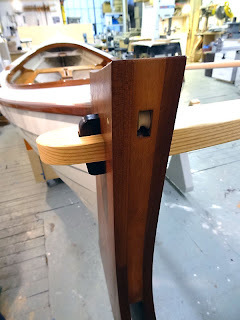 The mortise has a pitch that matches that of the wedge, which when tightened pulls the shoulders of the tiller's tenon up tight against the rudder. 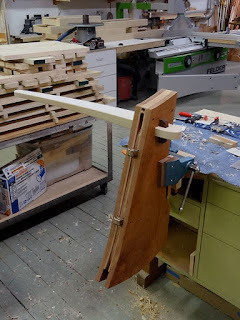 Sawing out the tenon on the bandsaw. 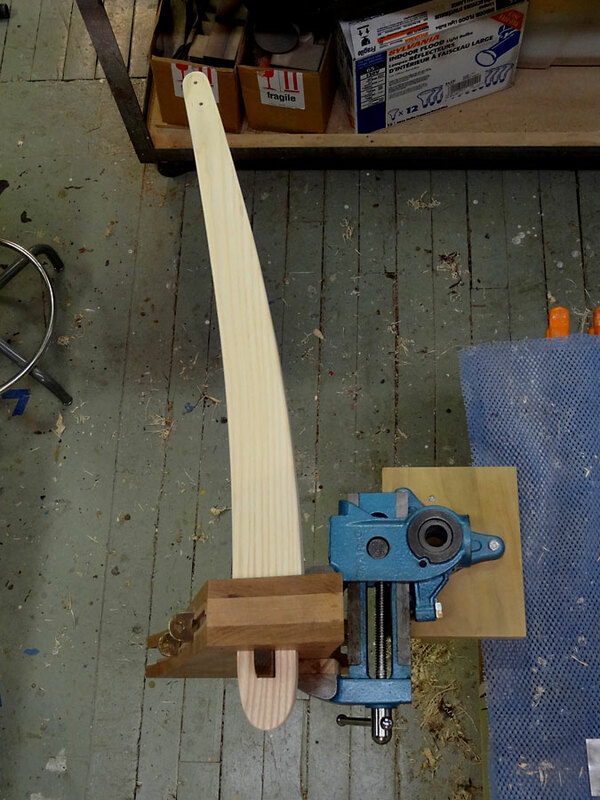 A rabbet plane will tune the fit. Tiller, tusk tenon, and wedge (made of wenge). I still had to cut and drive the brass pins that secure the gudgeons and serve as axles for the up and down haul sheaves. I cut these just slightly long, drove them through, then peened over both ends to secure them in place. Gudgeon pins and sheave axles are driven in and peened. I like this picture. This is the up-haul sheave. 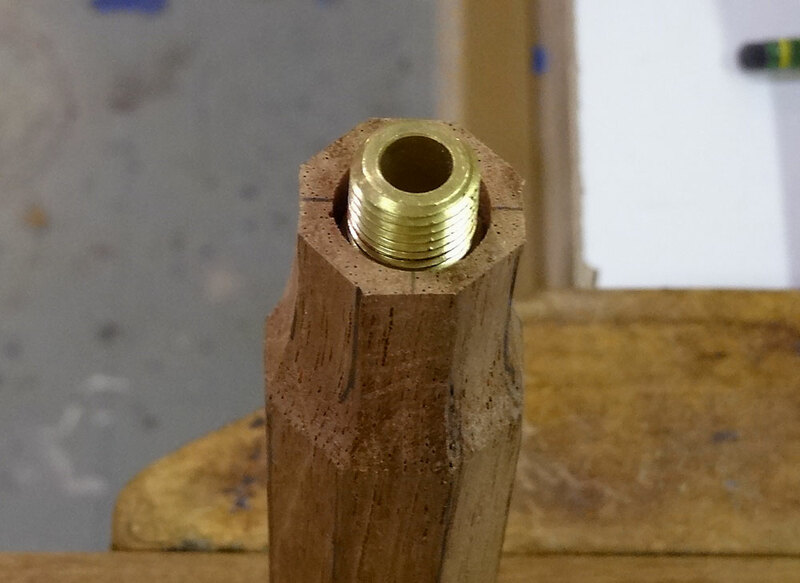 Brass hose coupling is epoxied into a hole in the end of the tiller extension. The male thread is epoxied into each of the two handles. The next job was to fabricate the tiller extension. This is really just a long push-rod. I decided to make it though, in two parts. One, the basic rod with a universal joint at the tiller end, and two different length extensions to allow some freedom with crew placement fore and aft. I made a long extension to use solo, with the skipper further forward, and a short one to use with the skipper aft, and crew forward. This may or may not prove to be useful, and only time at the helm will tell. But I have the option. To do this, I drilled out the ends of the rod blanks, and epoxied in some threaded air-hose couplings. The two different length extensions have male threads, and the fixed length push-rod has the internal female thread. I drilled these out by hand and eye, but I would have been better off taking more care with a machine setup. The extensions don't sit perfectly, but they are good enough. I used a dremel to clean up squeeze-out on the threads. 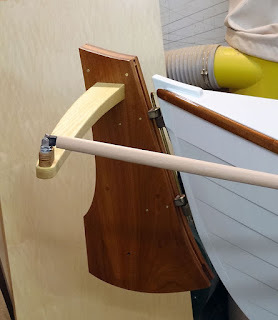 Tiller extension and long handle are screwed up tight and faired round together. Tiller extension and short handle. 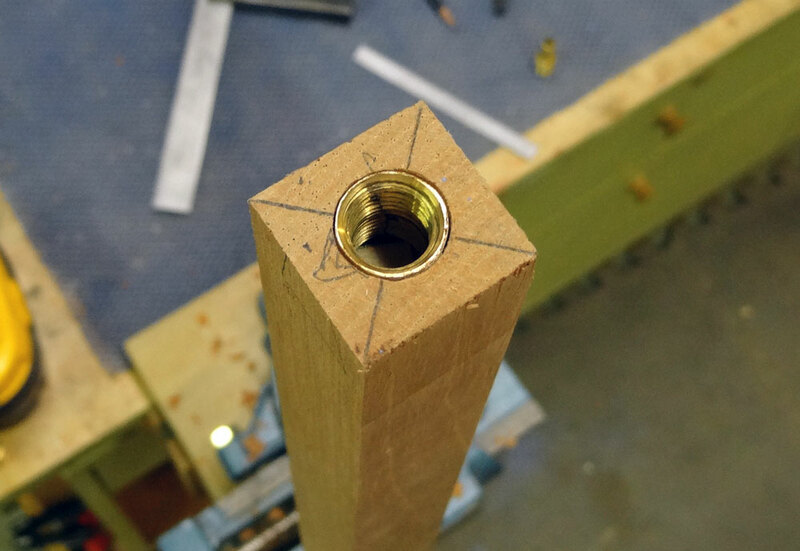 Mortise for universal joint fitting. U-joint mounted to pad on tiller. Tiller extension with long handle. Computer lofted foils. Dagger and rudder. The foil shape is marked on the daggerboard's end. 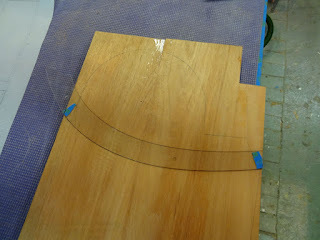 Facets are marked out and planed flat. 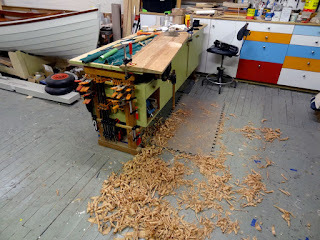 Its a workout with hand tools! A gouge is used to carve the transition from foil to square section. All of the extension parts are made from spanish cedar, round or oval in section. I cut these out like a spar, eight-siding, then shaving round. 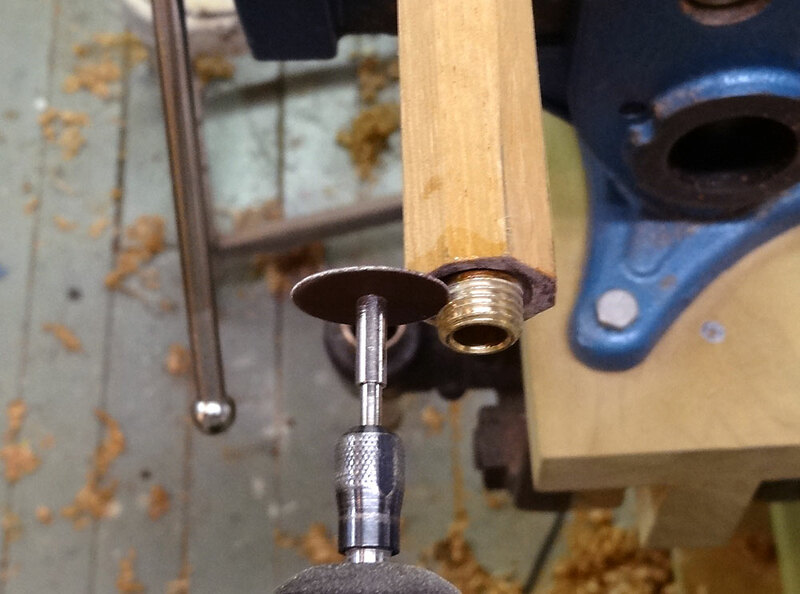 I then fitted the universal joint, scavenged from an old Laser tiller, and glued it into the tiller extension's end. This sits on a pad to elevate the push-rod a little (I think my rudder could have been set higher). 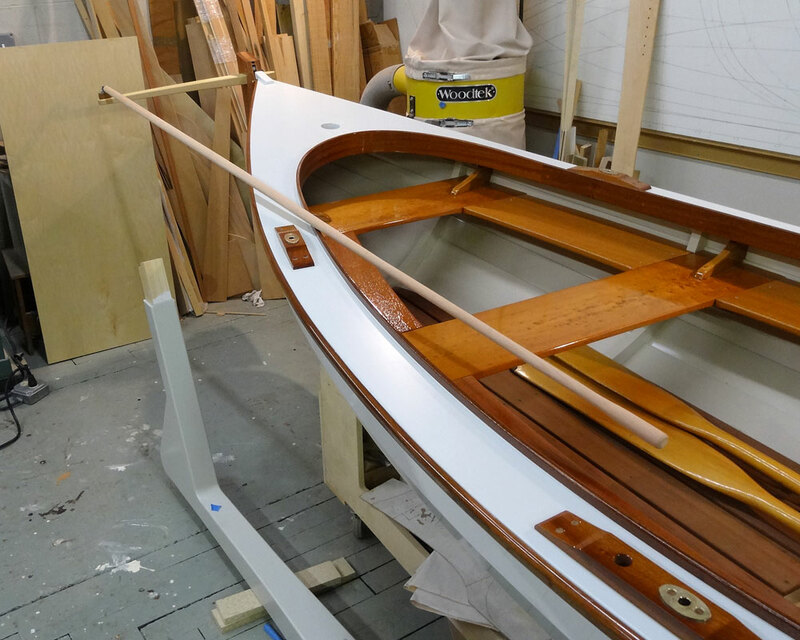 At this point, I still need to wrap the tiller extension ends tightly with marline and epoxy the lashing, to help strengthen the couplings. 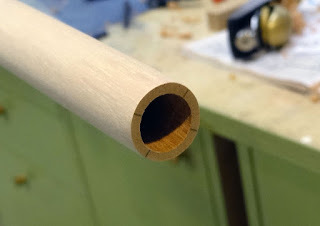 The wood tube wall is kind of thin in those locations. With these parts done, I moved on to the rudder blade and daggerboard. 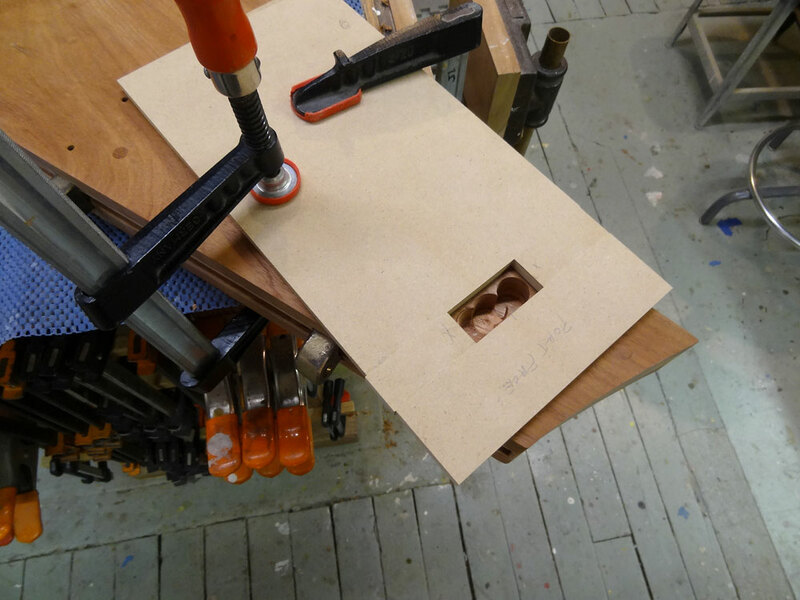 I glued up my rough blade blanks (spanish cedar, again) and cut them out as squared rectangles to shape the foil sections. 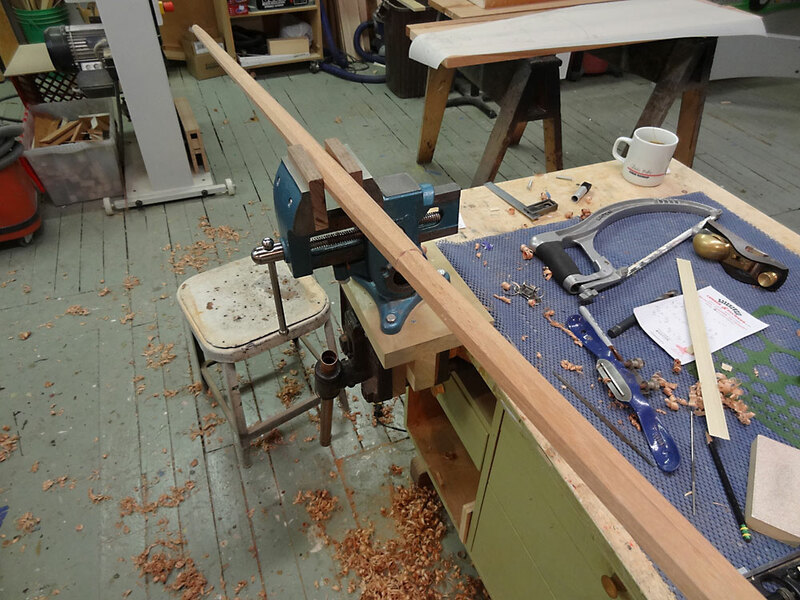 It is better to have the ends square to lay out the foil sections, and any plan-form shaping will be done after shaping the foils. An accurate center line is scribed along all of the edges, and a half-foil template is laid on the line at the foil's end and traced. Note: These foil shapes are my own concoction. I used to loft Naca sections, but now I just draw them out in the computer, based on my required thickness. For these boats, anything close to a foil, and smoothly finished will do. 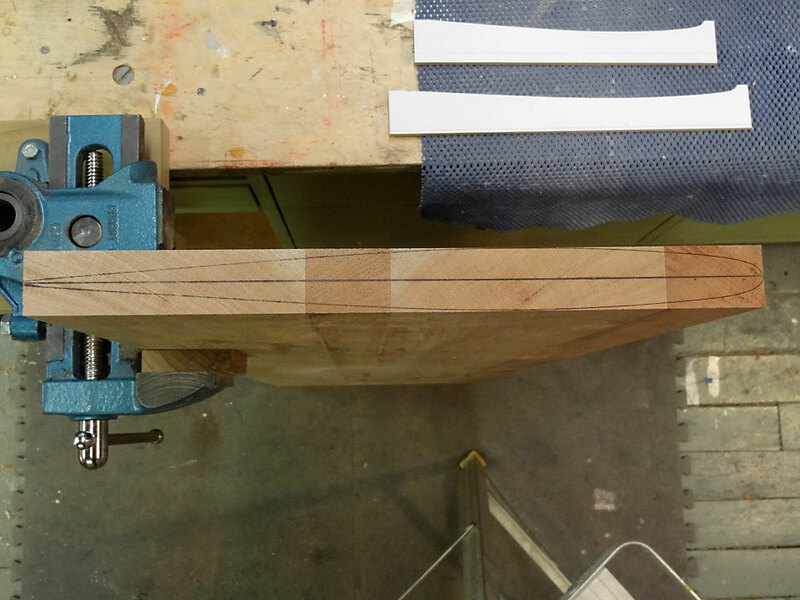 To maintain symmetry, a series of flat facets are laid out equally on each side of the board, and dressed flat with whatever tool will get the job done. In my case, I used a drawknife, spokeshave, slick, big fore plane, block planes, and any other edge tool I thought would help, to avoid the dust created by a big grinder. There is a lot of material to remove, so it is a real workout. To further complicate matters, each foil has to transition to a square section at the top. 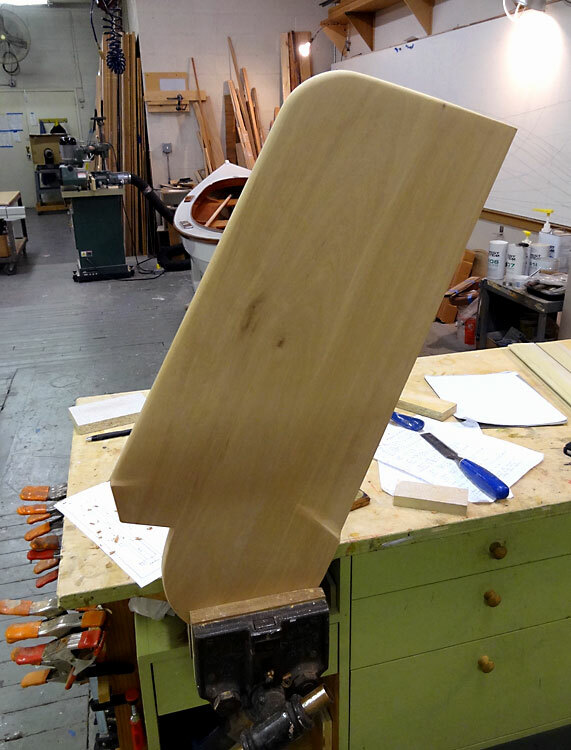 The daggerboard has to fit the rectangular trunk opening, and the rudder blade has to pivot inside the rudder cheeks. Also, the transition should be coved, rather than abruptly squared, to prevent creating a stress riser. Once the facets are cut, a spokeshave knocks the hard corners off, much like 16-siding a spar. I then use a shop-made, flexible longboard, sanding diagonally first one way then the other across the grain to curve the sections. 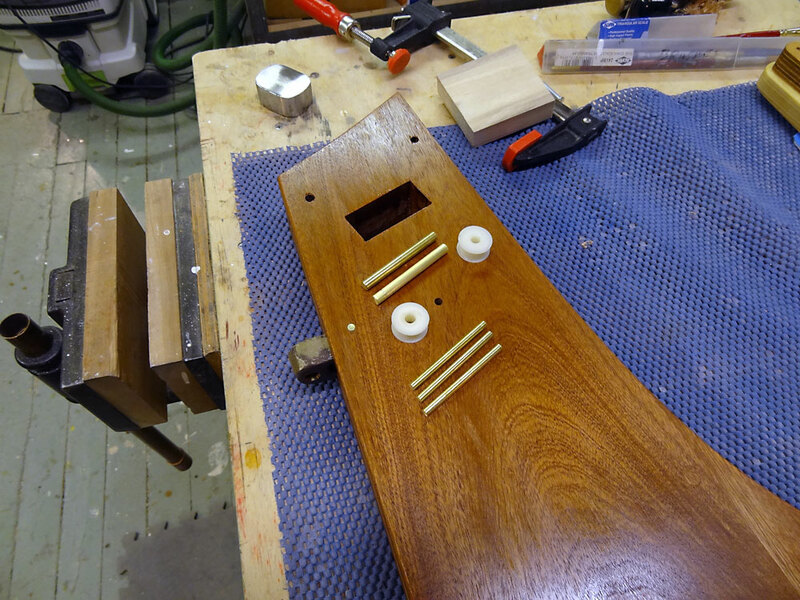 When it all looks good, and the transitions are done, I get out the random orbit sander with a nice soft pad and some 120 grit discs, and carefully smooth out the foils. I keep the sander moving, and use a light touch. It works very well. 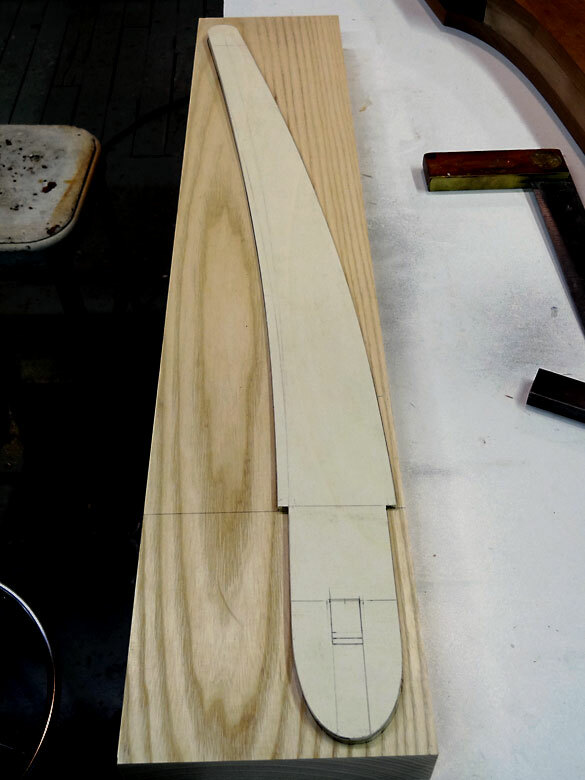 With everything right and smooth, I finally cut the plan-form shapes on the blades. The daggerboard tip was cut at the proper angle, and the leading corner was radiused. These edges were then rounded over and sanded into the foil sections. 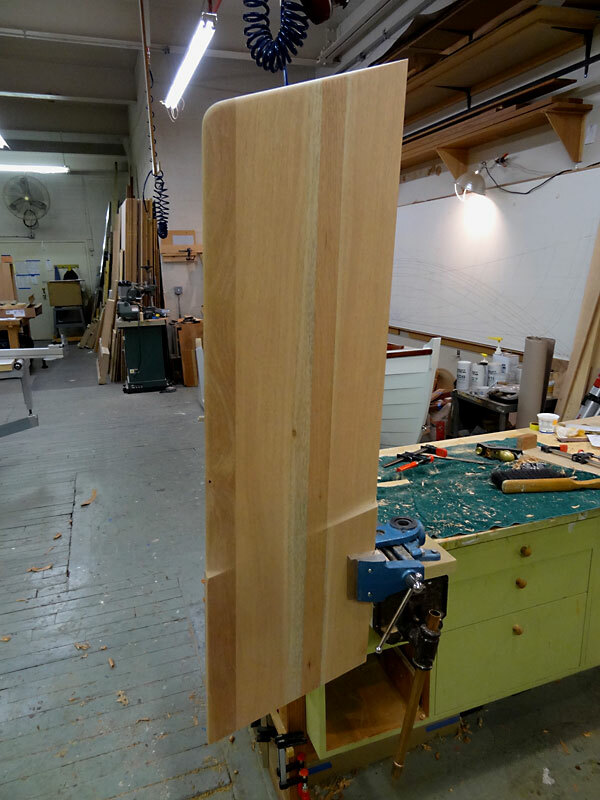 Rudder layout, with pivot location. Rudder in the kicked up position. The rudder was cut out, with a big circle at the top, which rotates inside the rudder core. 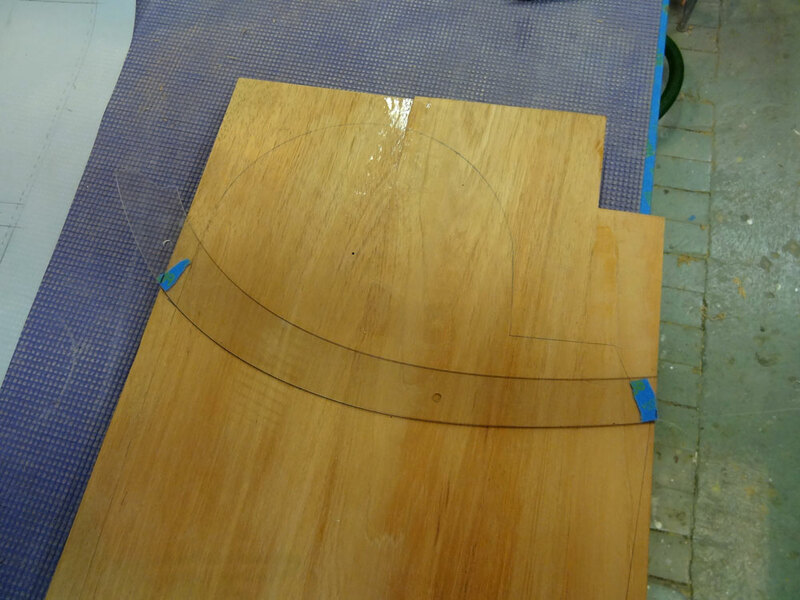 The bottom was cut, rounded, and shaped just as I did for the daggerboard. 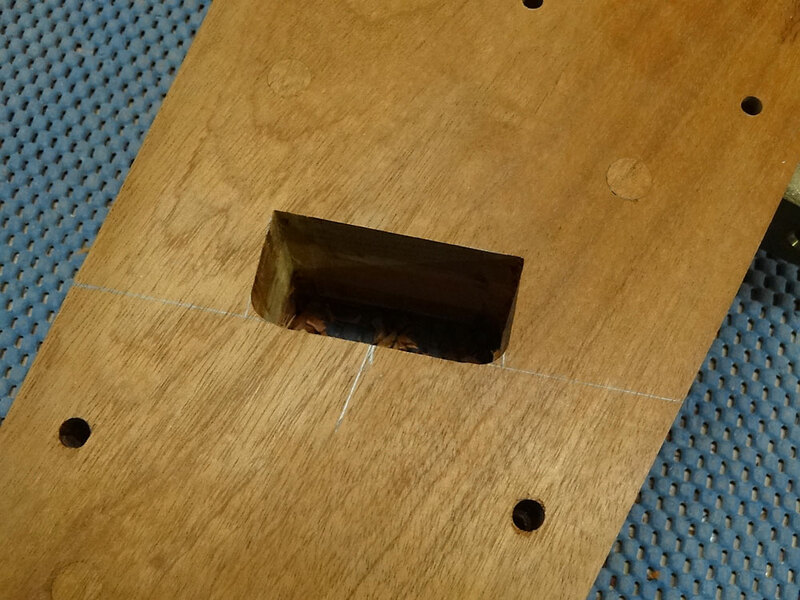 I drilled the hole for the pivot bolt, then assembled the rudder to check that everything worked as planned.